We are pleased to announce that we have acquired a few of Buddy's Fine Art works for sale. Sedona, Sea Power and Hong Kong. 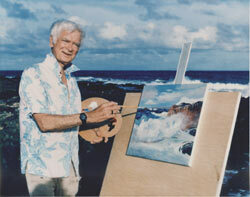 A life-long fascination with the breaking wave inspired the painting "Sea Power". 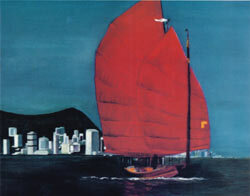 The red-sailed product and survivor of an ancient culture, casting a figuratively, fore boding shadow over the towers of a more modern civilization. 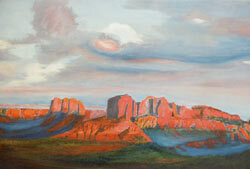 One of the first of his art works now on exhibition is the majestic "Sedona". A view of that legendary place in Arizona, where it is believed, Indians communed with the Great Spirit over the centuries.